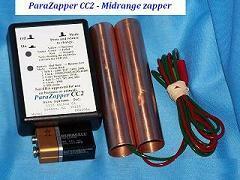 Many of our original Hulda Clark zappers are still being used from 17 years ago. Video documentation - Be sure to see our zapper videos below. 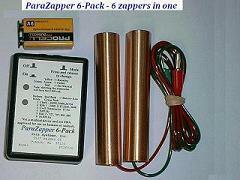 Testimonials - There are several zapper testimonials here. Dual frequency and triple frequency versions are outdated, even when the frequencies are combined. Rife frequency generators are superior due to producing specific frequencies. The Positive offset square wave is very important for destroying viruses, bacteria, and protozoa, likely making this a good virus zapper or microbe zapper. You can find cheaper Clark zappers and more expensive zappers, none matches ours, not even the Terminator Zapper or Best Zapper, all are far superior to Ultimate Zapper. 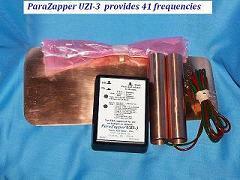 Only ParaZapper is proven to actually kill microbes such as bacteria, protozoa, and fungi. See the difference. Known as the Dr. Hulda Clark zapper or Hulda zapper. This is a true multi frequency generator. Originally, parasite zappers were introduced by Dr. Clark in her book Cure for All Diseases and are a crude attempt to replace frequency generators and are used to kill miclobes with mild electric pulses. Due to advanced circuitry, our multiple frequency generators are far more effective than any competing products, including Bob Beck and especially the ultimate zapper or the digital, are made in the U.S. and include Rife Frequencies, Crane Frequencies, and Clark frequencies in easy to use modes and they meet or exceed ALL of Dr. Hulda Clark's recommendations and requirements. Our best, the MY-3, meets Dr. Rife's requirements. The real advantage that we offer is range, accuracy, precision, and ease of use. 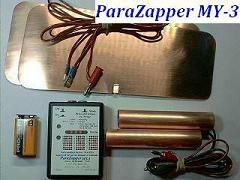 Video: ParaZapper MY3, World's Best Zapper from a customer. If you are looking for the best quality, reliable Hulda Clark Zapper with Rife frequencies that can really produce genuine results, then read on. even though we don't make any claims for health, healing, treating, or curing disease or illness, we can show you that our products can and do kill many microbes such as bacteria, protozoa, fungi, and others in water, proving that our's outperform the competition and making them the best available. Since it is not possible to see a virus without killing it first, we can not claim to zap a virus and no one else can either. There is no doubt about the difference in quality, reliability, and function of our ParaZappers above others, you will be convinced, especially after reviewing the almost three dozen customer produced videos, some listed below. If all that you are looking for is cheap and aren't concerned about how well the product works, there are other versions available. There is no match for ParaZapper ™ regardless of what others may claim. Please note that due to FDA regulations, these otems aren't allowed to be sold or intended to be used as healing and for that reason should not be called such. However, it is the right of any individual to choose to use these for their needs. The FDA regulates companies and their products but not individual choices. Also, due to FDA regulations that prohibit such actions, they are not sold for the treatment or cure of any disease, including cancer or AIDS. Prices: $137 US to $699 US. see the menu on the top of this page. 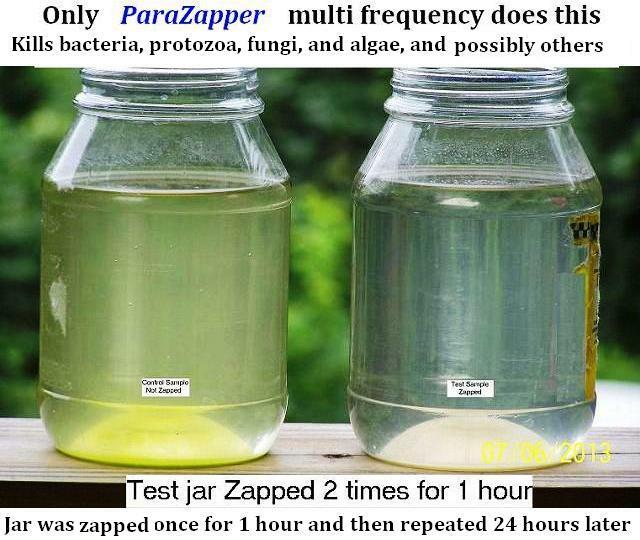 Visible Proof Image Below shows that ParaZapper kills parasites such as bacteria and viruses in the jar on the right. They are killed by zapping with ParaZapper for a 1 hour session, two days in a row. Competitor's units do not work this well. The cloudiness and color of the control jar on the left shows that there are still living microbes in it. It is not possible to evaluate for a virus. Although not proven, we expect that the same would happen with a virus. If it can do this with water, why couldn't it do the same with other water based systems such as the human body? It is definitely time for more studies and research on the advances over Hulda Clark's original versions especially for cancer and othe health concerns. The older ParaZapper Hulda Clark models were previously sold on paradevices and petzapper com websites and were even then superior to the ultimate and the best zapper. 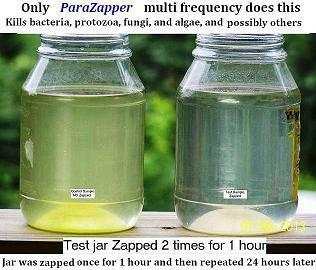 Since it is not legal to sell zappers as a medical device, they are now sold for water treatment, that you can use as you wish. a product suggested for killing microbes in water.